Members are active in participating races and various activities. １．With friendly competitions among members, develop your running skills and also improve and maintain a good health. ２．With Club activities, members are committed and develop friendly relations with each other. It has formed an invaluable bond because it helps to live a fulfilling life. ３．With Club activities, it contributes to the development of local public sports activities and training healthy elementary and junior high school student. URC actively supports the Tokyo Bay Urayasu City Marathon. ４．Through interactions with Orlando Runners Club, URC contributes to the local people`s development of international exchange. 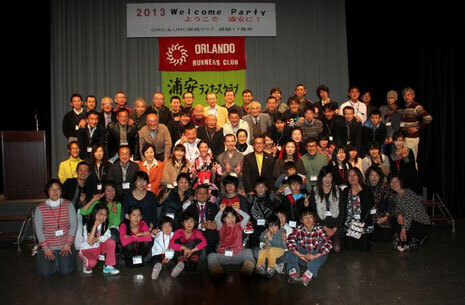 This is a commemorative photo of the welcome party and international exchange with the members of sister club Orlando Runners Club, Florida, USA. ○ The efforts of regular training are demonstrated more than enough by every member participating in a variety of races in a wide range both domestic and international in triathlon, trail run, ultra marathon, full marathon, medium long distance running less than 10 km, long distance relay. For example 40 of the members are ultra marathon runners and 10 members have completed sub three running. 3 members are qualified as International Women's Marathon runners and a dozen members are ranked in the top 100 of Japan Marathon Ranking for the age range from 30`s to 70`s . ○ The success of elementary and junior high school students in Turtles: Many of the top finishers of every year conducted Tokyo Bay Urayasu City Marathon (3km), Urayasu athletics tournament are members of the Turtles. ○ Maintenance of good health. For better health many of the members enjoy jogging, walking and swimming depending upon individual’s physical strength. ○ Welcome event for the Orlando Runners Club (ORC) members visiting URC. For members of the ORC those who participate in the Tokyo Bay Urayasu City Marathon and family members, are welcomed by the whole URC, organize a welcome party, host a home stay, guide the tourist spots and these activities promote the friendship between the clubs every year. For elementary and junior high school students, it is a good opportunity to interact and mingle with foreigners. ○ Adzuki soup with rice cake enjoying – get together at the beginning of the year, Flower viewing party, Urayasu fireworks display viewing party, Yearend party etc. Various events organized by the club and volunteers, helps to develop friendly relationship among members and also it is and it is an invaluable bond to live a fulfilling life. Three teams made a hard training these days. Which team do you think win the prise? You might see them in next party!